One of the joys of writing a blog is having an online record of how often I contradict myself. Last week, I stood up here on my soapbox and declared myself officially stewed out. And then, naturally, 2 days later, I hauled out the old Dutch oven and made a lamb stew. What can I say–coming up with dinner this time of year can be tricky. Your heart aches for spring produce, but your chilled bones still crave heartier dishes. Even though emotionally you might be ready to trade beets and squash for peas and asparagus, hefty meat-based mains for light fish dishes and salads, physically you’re still battling cold weather and want to eat something warm and satisfying. 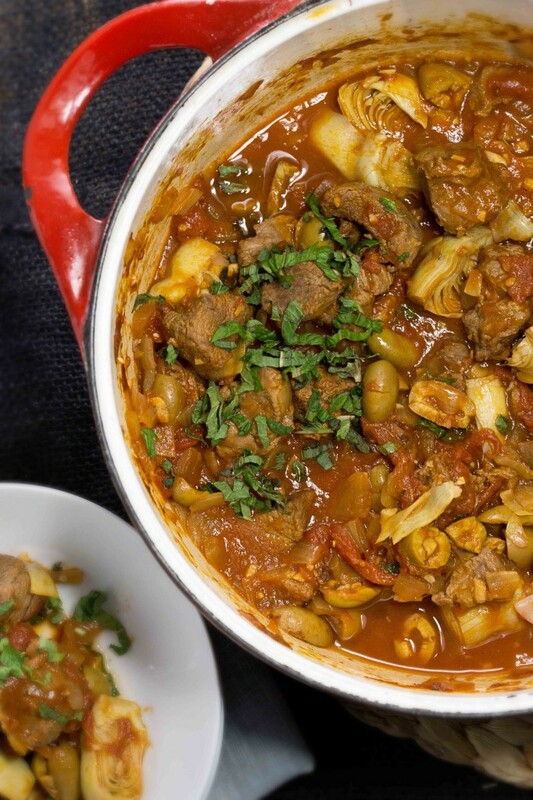 Thankfully, this stew gives you the best of both worlds. It’s a hearty, but not heavy, celebration of in-between seasons eating. 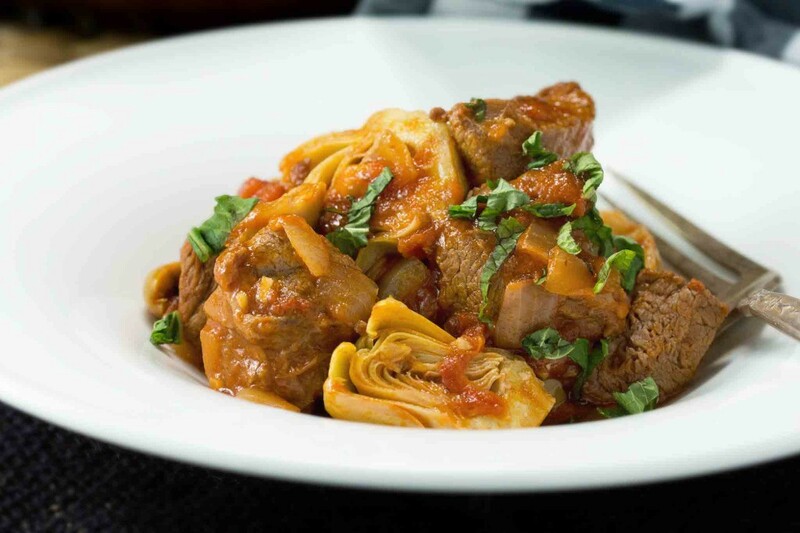 Chunks of lamb shoulder are braised until fork-tender in a bath of white wine and tomatoes. 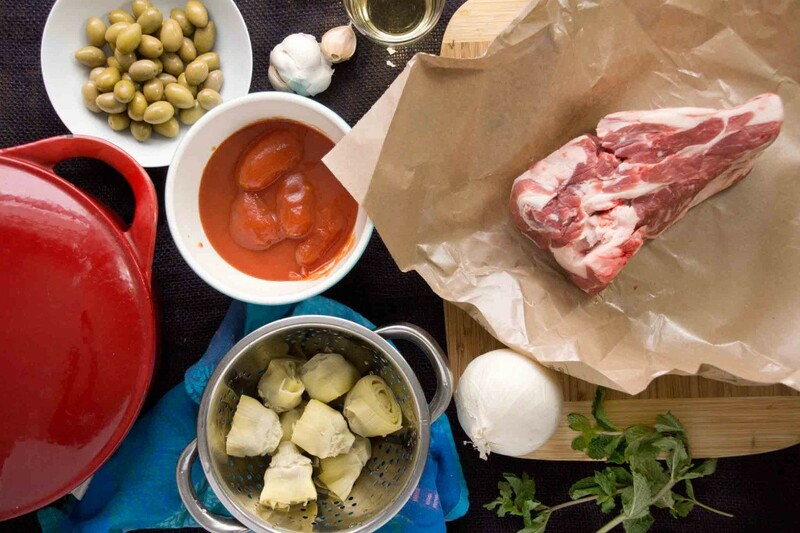 Artichoke halves and green olives share the spotlight with the lamb, keeping it from being nap-inducingly heavy and a handful of mint scattered over the top keeps it fresh and lively. 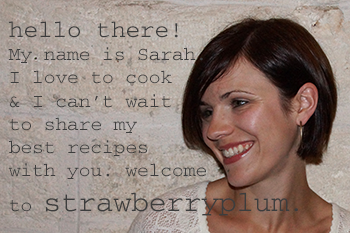 Gather up your ingredients and let’s get cooking! 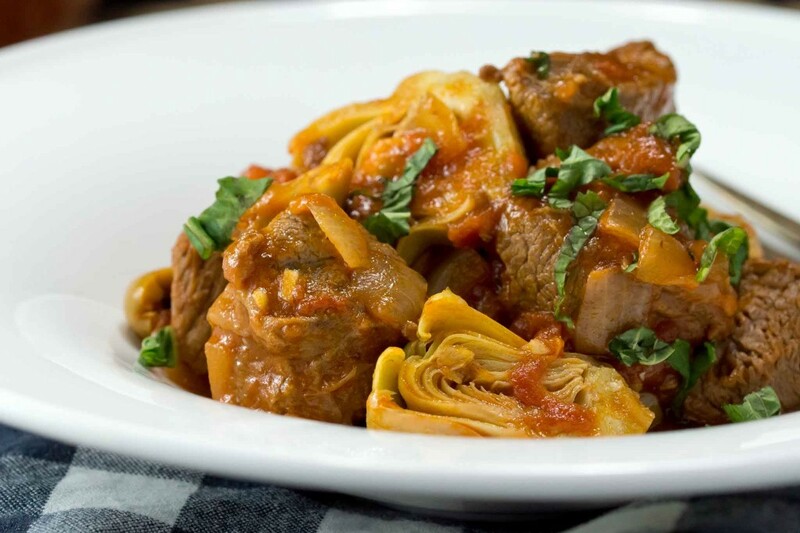 You’ll need a couple of pounds of lamb shoulder, a can of artichokes (though if you have access to fresh, a. I’m jealous and b. feel free to use those instead! ), some picholine olives, plum tomatoes, an onion, fresh mint, white wine, and chicken stock. 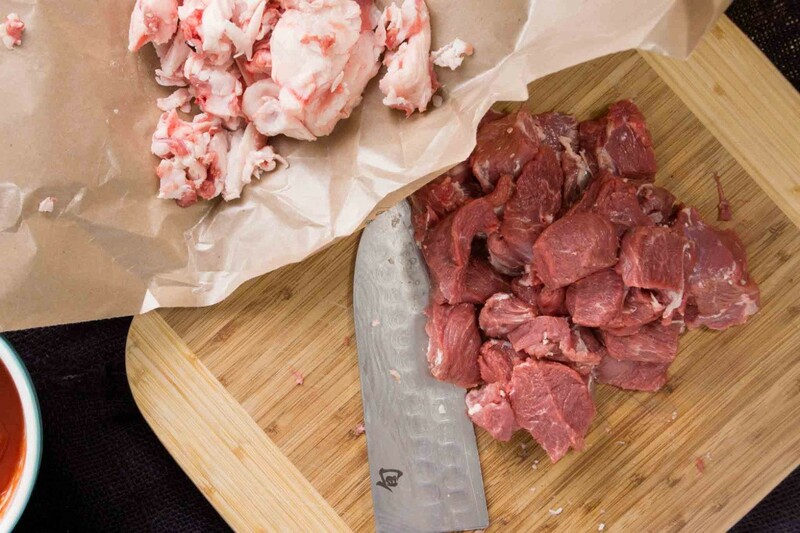 If you’re lucky, your meat counter will have lamb shoulder already cut into cubes, ready and waiting. I swear this is an option at my grocery store every day except the one I choose to make lamb stew. Sigh. If that’s the case, just trim off the fat and cut a big chunk into a bunch of little chunks. Brown the meat, then pull it out of the pan and start building the base of the stew. Sauté an onion, add a bit of garlic. In goes the white wine, followed by crushed tomatoes, and a handful of olives. Put the lamb back in the pot, pour in some stock, and let it gently bubble away for a couple of hours. 10 or 15 minutes before the end, stir the artichokes. This should give them enough time to soak up the juices without falling apart. Finish the stew with a handful of chopped mint and serve it up. We had ours on its own, with a hunk of crusty bread on the side the first night and over toasted Israeli couscous the second. Had there been any leftovers, I would have happily scarfed it up a third night in a row. So over stew? I guess I’ll have to eat my words. Gladly. 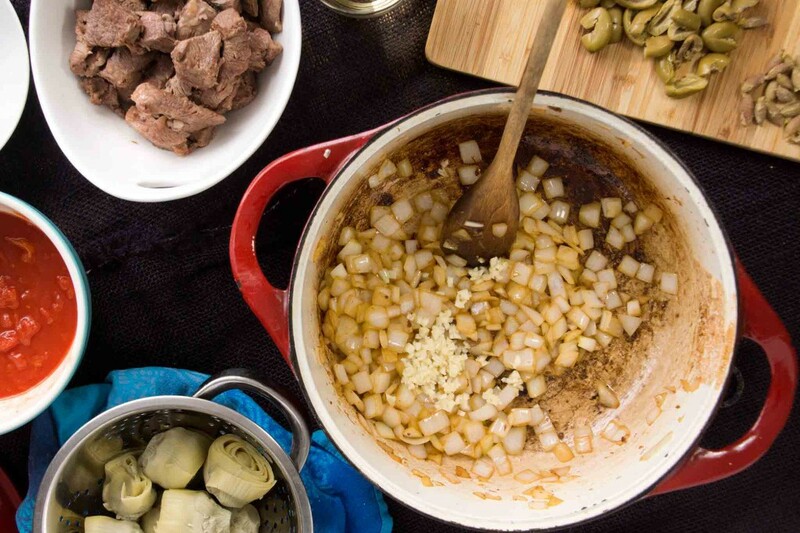 This lamb and artichoke soup is perfect for a late winter dinner when you’re starting to think spring but still experiencing the realities of winter! Season the lamb with kosher salt. Heat about 1 Tbsp. 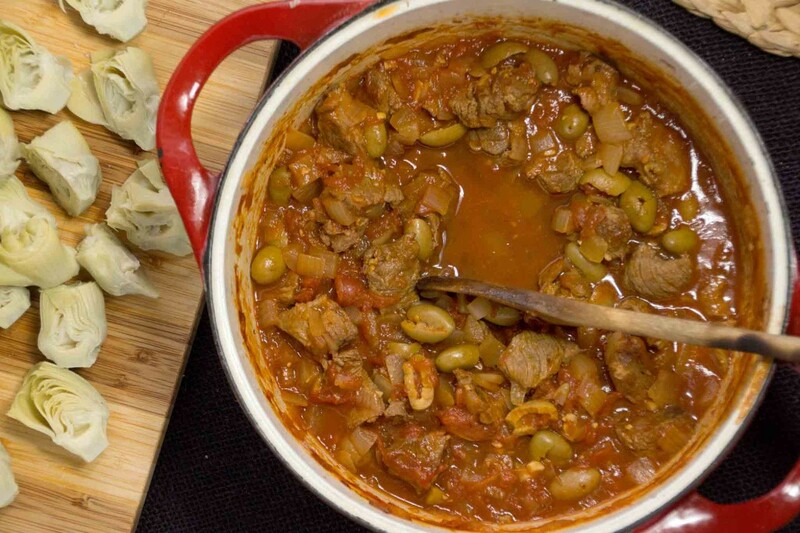 of olive oil in a Dutch oven over medium-high heat and add half of the lamb. Brown the meat on all sides, 6-8 minutes total. Transfer to a plate or bowl, add a little more oil to the pan, if necessary, and brown the remaining lamb. Transfer the second batch of lamb to the plate or bowl. If excess fat or liquid from the lamb remains in the Dutch oven, drain it off and add another Tbsp. of oil. Place the pot over medium-high heat, add the onion, along with a pinch of salt, and sauté until the onion becomes translucent, about 3 minutes. Add the garlic and continue to sauté for a minute or 2 until the garlic is fragrant. Add the wine; bring to a boil and allow most of it to cook off, 1-2 minutes. Now add the crushed tomatoes, olives, meat and any juices that may have accumulated, and stock. Bring the liquid to a boil, then reduce to a simmer. Simmer, partially covered, until the meat is quite tender, about 2 ½ hours. During the final 15 minutes of cooking, stir in the artichoke halves, and taste, adjusting the seasoning as needed.